The proverbial “Elephant in the Room” is getting bigger (‘yu-u-ger’), and it’s getting harder, almost impossible, to ignore it. 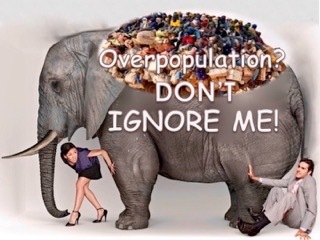 The elephant metaphor, of course, represents a topic most people either ignore or deny exists: overpopulation. Now that most people worldwide are finally acknowledging the reality of global warming or climate change, perhaps world citizens might also begin acknowledging the upstream cause of most environmental and socio-economic-political crises, which is: overpopulation. I realize all too well how sensitive this topic is, but I nevertheless feel compelled to bring it into the market place of topics worthy of discussing, as intelligently, sanely, and civilly as possible. Bettye and I support several population organizations, among them: World Population Balance (WBP), a local organization; Population Connection (PC); Population Matters (PM); and Negative Population Growth (NPG). If you’re unfamiliar with these organizations, all promoting long-term humane ways to reduce population, you might want to check them out. This past week NPG sent to supporters a downloadable preview of their latest position paper: Sanctuary Cities: Politics Overshadow Responsible U.S. Immigration Policies. It may seem odd that someone who thinks of himself as a progressive would also be concerned about the effects of immigration policies on population growth. It’s simple to explain. As a sustainability activist, I’ve come to realize the unequivocally direct connection between increasing population growth and the series of converging crises humanity is facing. The U.S. is less populated than much of the world, but there are good reasons to be concerned about future population growth, especially when considering approximately 11.5 million undocumented immigrants. The NPG paper mentions media coverage referencing U.S. “sanctuary cities”, those that serve as safe enclaves for undocumented workers. In addition to several of our largest cities, it seems that many other cities also avoid enforcing current immigration laws. Essential information about illegal immigration from reliable population experts is transparently missing in the media and the public arena. What’s particularly worrisome is that in all of the mass media and government debate over this issue, there has been no detailed discussion about the impact of sanctuary policies on U.S. population size and growth—and its many consequences. In early August, 2016, the U.S. Census Bureau projected our nation’s population at over 324 million, with an average growth of 1 person every 11 seconds, in addition to an average net gain of 1 international migrant every 29 seconds. So the U.S. population is growing rapidly—more than 2.4 million people annually (the population of greater MSP metro is 3.6 million). NPG expresses concern that, while Americans hear much about the proposed ethical, humanitarian, and moral arguments for creating more sanctuary cities, they hear very little about how current immigration policies actually promote immigration, the primary driver of U.S. population growth. Moreover, very little information is available about how population growth affects the many serious issues we’re facing, such as: damaging our living environment; straining our economy; overburdening our crumbling infrastructure; increasing crowding of schools, roads, and hospitals; adding to water and air pollution; increasing consumption of dwindling natural resources; contributing to climate change; causing mass flora and fauna extinction; draining government budgets; creating water shortages; and, in general, diminishing our overall quality of life. Americans face all of these problems every day, and they all are a direct result or consequence of population growth, which increasingly is connected to annual immigration rates. In sum, “America has become a sanctuary nation, and present politics have overshadowed our responsibility to future generations” (NPG). An appropriate closing statement is posed as a question by the late Professor Al Bartlett: “Can you think of any problem in any area of human endeavor on any scale, from microscopic to global, whose long-term solution is, in any demonstrable way, aided, assisted, or advanced by further increases in population—locally, nationally, or globally?” Aside from the economic-growth argument posed by neoliberal economists and their followers, I can’t. Can you? > Resource Insights: Climate Change Begins Now (Even If We Are Unprepared) (Kurt Cobb). Climate change has arrived. Some like to call it climate chaos because it changes the climate in different places in different ways and at different rates. One thing we do know. The climate we grew up with is no longer. That implies that our entire infrastructure of roads, rails, cities, farms, dams, in fact, nearly everything may be inadequate to the challenges posed by climate change. Our first priority ought to be securing the food we will need. That will mean rethinking all of agriculture which is now based on an industrial model implemented during a period of exceptional climate stability from the end of World War II through the end the last century. We imagine wrongly that mere engineering or innovative technologies will provide solutions, as they are not free. We will find it very, very expensive simply to protect our current ways of doing things rather than change them to accommodate climate change. > Our Finite World: An Updated Version Of The “Peak Oil” Story (Gail Tverberg). [This excellent article is long and packed with information; the author’s final paragraph summarizes her thoughts about the future]. We should not be surprised if the financial problems that the world is now encountering will eventually resolve badly. This seems to be how the Peak Oil story will finally play out. Without rising energy per capita, the world economy tends to shrink. Without economic growth, it becomes very difficult to repay debt with interest. Wealth disparity becomes more and more of a problem, and it becomes increasingly difficult for governments to collect enough revenue to support their needs. Our problems begin to look more and more like those of earlier economies that hit resource limits, and eventually collapsed. > Peak Prosperity: Daron Acemoglu: Why Nations Fail (Adam Taggart; podcast/transcript; Chris Martenson). Why have some of the world’s largest empires eventually crumbled? What are the ‘best practices’ that a modern nation should follow if it desires sustainable prosperity for its citizenry? MIT professor Daron Acemoglu and co-author of Why Nations Fail claims that, while national prosperity has some correlation to the resources available to the State, it’s more importantly determined by how those resources are put to productive—and fair—use. A fair summary of the book: “The US is an example of inclusive economic and political institutions but it’s always had its own challenges, starting with slavery; then building up to great inequality both economic and political during the gilded age which saw robber barons and huge monopolization of American business; then segregation; and now a remaining sidelining of a significant fraction of US population in terms of economic opportunities”. > Resilience: The Discrete Charm Of Economic Growth (Kevin Carson-Review: Robert Balthazar’s The Discrete Charm of Economic Growth. Part I: The Bilinguals; Part II: The Making of an Overriding Collective Preference (2016).) The doctrine of “economic maximalism,” or growth for its own sake, is at the heart of a legitimizing ideology actively promoted by all the centers of cultural reproduction, that not only present growth and increased consumption as desirable, but present a state of affairs in which these goals are maximized as natural, inevitable, and—yes—the “spontaneous outcome of individual preferences.” In short, we live in a system whose complex of ideological institutions conditions to view its dynamics as a fact of nature rather than something that results from the application of power and reflects the interests of those who are in control. > Grace Communication Foundation: Post Carbon Institute’s Asher Miller On The Sustainability & Resilience Of Our Food System (Kyle Rabin,interviewer). Our sustainability crisis is the confluence of a number of complex, adaptive systems all interacting and influencing one another (see Richard Heinberg’s Five Axioms of Sustainability). The biggest barriers to achieving a more sustainable food system include: dependence on fossil fuels throughout the food supply chain; North American/European food consumption patterns and expectations—like animal protein; population growth and growing demand from the “developing” world for Western levels of food consumption; top soil erosion and fresh water depletion; climate change; the crash of fish stocks and ocean acidification; and the political influence of Big Ag corporations on food policy. Examples of fossil fuel-free food production are in communities where modern, industrial food systems have yet to gain a foothold. > Reuters: As Earth Swelters, Global Warming Target In Danger Of Being Missed (Alister Doyle). The Earth is so hot this year that a limit for global warming agreed by world leaders at a climate summit in Paris just a few months ago is in danger of being breached. In December, almost 200 nations agreed a radical shift away from fossil fuels with a goal of limiting a rise in average global temperatures to well below 2 degrees Celsius (3.6 Fahrenheit) above pre-industrial times while “pursuing efforts” for 1.5C (2.7F). But 2016 is on track to be the hottest year on record, also buoyed by a natural El Nino event warming the Pacific, according to the U.N.’s World Meteorological Organization. The first six months were a sweltering 1.3C above pre-industrial times. Many climate scientists say the Paris targets are likely to be breached in the coming decades, shifting debate onto whether it will be possible to turn down the global thermostat. > Think-Climate Progress: Heatwave Blasts New York To D.C., Sign Of More Extreme Weather To Come (Samantha Page). The National Weather Service has issued an “excessive heat warning” in the Mid-Atlantic. A heat index of up to 110ºF “will increase the risk for heat-related health issues, especially for the elderly, those with chronic health problems such as lung and heart disease, those working outdoors, and other sensitive groups of people.” Heat waves are a growing trend across the globe. This summer, the Middle East has experienced record temperatures. July saw the heat index in Iran and the U.A.E. hit an almost unimaginable 140ºF. Actual temperature in the region hit hemispheric records of 129ºF. In addition, the National Weather Service announced there is “significant flash flood potential” in the Gulf Coast, along with flooding potential “from Texas to Maine.” Increased precipitation in the strongest storms — in other words, more intense storms — has been linked to climate change. > Daily KOS: The First Video Of Coral Bleaching Behavior. Hot Ocean Water Continues For 3rd Year In A Row (Pakalolo). A new NOAA outlook released to the media in June of 2016 indicates coral reefs around the earth will likely be exposed to higher thermal stress due to increasing sea temperatures for an unprecedented third year in a row. This will lead to increased bleaching worldwide, with no signs of the process stopping. Coral reefs are very fragile and highly complex communities. They are currently at risk because of a phenomenon called coral bleaching, which is the loss of color in the relationship between algae and the coral. This happens when the algae is expelled from the body of the coral or from the loss of algal pigmentation. We are in the danger zone at this very moment. Every single fossil fuel molecule that we pump into the atmosphere is pushing us closer and closer to total biosphere collapse. > Environment & Energy Publishing: SPILLS: Drilling Mishaps Damage Water In Hundreds Of Cases (Mike Soraghan, Pamela King). When a pipeline break in North Dakota spilled salty, toxic drilling wastewater into a tributary of the Missouri River last year, it was national news. But it was only one of more than 640 oil and gas spills that affected groundwater or surface water in some way in 2015, according to a review of state and federal records by EnergyWire. Such spills can contaminate water with oil, salt, metals and even radiation. At nearly 3 million gallons, the January 2015 pipeline break north of Williston, N.D., was the largest spill reported to have affected water (Greenwire, Jan. 26, 2015). Most were far smaller. Since 2009, nearly 2,500 spills have been reported to have affected groundwater in some way, but that is likely an undercount. Overall, there were at least 10,348 spills, blowouts and other mishaps at oil and gas sites last year. > Midwest Energy News: Report: States Stand To Gain If Corporations Have Better Access To Renewables (Andy Balaskovitz). The report lists the top 11 states that are “above average” when it comes to clean energy resources available as well as having large industrial energy loads, which includes Indiana, Michigan, Minnesota and Ohio. The report makes six policy recommendations that would make it easier for large energy users in those states to access renewable energy, a growing trend among corporations globally. The Advanced Energy Economy (AEE) report’s two main proposals—expanding opportunities to buy renewables on the market and expanding opportunities for distributed generation—have been fiercely opposed by major investor-owned utilities. > Yahoo Finance: U.S. Employers Expect Health Care Costs To Increase 5.0% In Both 2016 And 2017 (Global Newswire). Employers expect total health care costs (both employer and employee) to increase 5.0%1 in both 2016 and 2017, up from 4.0% in 2015, according to early findings from the 21st annual Best Practices in Health Care Employer Survey by Willis Towers Watson (WLTW).2 In absolute dollars, employers expect average employee per-year costs to rise to $12,338 in 2016 and nearly $13,000 in 2017. Despite these cost pressures, 81% of employers will make relatively modest changes to employee premium contributions and other cost-sharing provisions such as deductibles and out-of-pocket limits for 2017. > Grist: There’s A New Toxin In Your Water To Worry About, America (Katie Herzog). To add to the “what might kill me in my home today?” files: According to a new report from Harvard researchers, 33 states have high levels of industrial pollutants polyfluoroalkyl and perfluoroalkyl (PFASs) in their municipal water supplies. There are loads of chemicals in our water, but PFASs are pretty rough. They’ve been linked with cancer, hormone disruption, high cholesterol, and obesity. High levels of the toxins were found in the water supplies of at least 6 million people, according to study author Xindi Hu, but because the government doesn’t keep data on PFASs in drinking water for a third of the country, exposure is likely far more widespread. How did so many PFASs get in the water supply? Well, they can be found in literally thousands of wildly varied products—from pizza boxes to camping gear. > Yes! Magazine: How To Break The Power Of Money (David Korten, “A Living Earth Economy”). Our current economic system is driving environmental collapse, economic desperation, political corruption, and financial instability. And it isn’t working for the vast majority of people. An economic system based on the false idea that money is wealth—and the false promise that maximizing financial returns to the holders of financial assets will maximize the well-being of all—inevitably does exactly what it is designed to do: benefit those with financial assets, who use their wealth to gain political power that enables them to use it for personal objectives. To build a truly coherent movement with the necessary strength to replace the failed system with one designed and managed to self-organize toward a world that works for all, we must challenge its bogus claims as logical and practical fallacies. We are living beings born of and nurtured by a living Earth. > Solutions Journal: Planetary Boundaries—Governing Emerging Risks And Opportunities (Victor Galaz, Aart de Zeeuw, Debbie Tripley, Hideaki Shiroyama). There are planetary boundaries within which humanity must find a safe space to flourish. They constitute environmental thresholds that, if crossed, raise the risk of undoing much human progress. Despite decades of worldwide discussion on sustainable development, reform of international governance and institutions is outpaced by the rate of global environmental change. Key elements of governance reform to drive sustainable development need a narrative that, grounded in the concept of planetary boundaries, offers opportunities for learning, innovation, and creativity at all levels, in both the North and South. More sustainable outcomes at the local level can be achieved where scientists and planners work together with local communities to integrate global and local knowledge and establish better, ongoing dialogue. > TED: The Taboo Secret To Healthier Plants And People (Molly Winter; Video & Transcript). Our poop and pee have superpowers, but for the most part we don’t harness them. Molly Winter faces down our squeamishness and asks us to see what goes down the toilet as a resource, one that can help fight climate change, spur innovation and even save us money. > Weathering The Storm: The Ozone – End Zone (Mike Conley). Ozone depletion was defined as a global threat requiring a global solution, and the world got behind it. Though the ozone hole can fluctuate annually due to natural factors, scientists are cautiously optimistic that we are now headed on the right trajectory. The similarities between the ozone depletion crisis and the climate change challenges we face today are astonishing, and there are two important lessons we can learn from it: 1) we can take heart in what we were able to accomplish as a global community working together on the ozone depletion challenge, and 2) realize that challenges of this magnitude have long, deeply-imbedded timeframes, with the best chance for success coming from addressing them sooner rather than later; a fact worth considering as we focus on the climate change challenge. > MPR: Farmers, Scientists Seek Common Ground On Going Green (Dan Gunderson). Scientists view cover crops as a not-so-secret weapon in the fight to cut farm pollution and boost soil health. But it’s been a challenge convincing farmers the benefits outweigh the risks. A short northern growing season rarely leaves time to plant a second crop after harvest, so farmers have been reluctant to plant cover crops. Researchers now, though, are trying to find common ground with farmers on using cover crops. A nearly $4 million effort will develop new equipment and seeding techniques. So rather than waiting until after harvest to plant a cover crop, seeds will be planted in the summer between the rows of already growing corn and soybeans. Scientists will also try to put an economic value on the benefits of cover crops to show the practice isn’t just good stewardship, it could help the bottom line. > Resilience: Basic Income Vs. Job Guarantee (Josh Davis). Universal Basic Income (UBI) is an old idea, the essence of which is that every citizen receives a monthly income from the state, regardless of work or income status. However, there is another policy proposal, generally referred to as a Job Guarantee (JG). which has the potential to both improve the financial stability of the un- and- under-employed, while also avoiding some pitfalls. Supported by a public budgeting process, communities decide what work is needed in their area, and all citizens are guaranteed jobs. This approach ensures everyone a minimal standard of living without the bureaucratic hassle and social-shaming indicative of means-based welfare programs. Unlike a UBI, a Job Guarantee (JG) is not an untested policy in our country, as evidenced by The Civilian Conservation Corps (CCC), the Work Projects Administration (WPA) during the Great Depression. > Ensia: We Need A Global Treaty On Plastics. Here’s What It Should Look Like (Nils Simon). Plastics have boosted our economy because they are versatile, cheap and durable. Yet, in the course of establishing a US$750 billion global industry, we have also created a massive problem that’s getting worse. The production of plastics reached 311 million metric tons (343 million tons) in 2014 and is continuing to increase worldwide. A number of initiatives have recognized the need to address plastic pollution more decisively, including the United Nations’ Sustainable Development Goals. A proper plastics treaty would include: 1) a common vision and clear goals, including a call for the sustainable management of all plastics throughout their life cycle; 2) a demand (and support) for building effective national collection and recycling systems; 3) creating conditions for a more circular plastic economy; and 4) providing mechanisms to deal with any plastic waste that remains. > Minnesota Landscape Arboretum: Pollinator Summit (presentations, exhibits, and more), Thurs., Aug. 18, Get more details and register here.